As a researcher, you want your work to make a real difference to the world. In other words, you want your research to have impact. How is impact measured? This is a controversial question. Many solutions have been proposed, including the h-index, the g-index, and the i10-index. However, these metrics are not without their disadvantages. And, to date there is no one-size-fits-all metric to measure impact for all disciplines. The h-index is the most commonly used metric and is based on a formula that includes the “X” number of an author’s publications and the number of citations that have been cited at least “X” number of times. For example, an author with an h index = 10 has 10 publications that have been cited at least 10 times. Therefore, the concept of “publish or perish”, which is based on publication count, is no longer entirely relevant. Now, you should be thinking “publish and promote or perish”, as citation count is considered equally important. Your article will not be cited if it has not been read. And, with more than 2.5 million articles published each year, getting fellow researchers and academics to find and read your articles has become increasingly difficult. Here, we discuss proven effective ways to increase the exposure to and readership of your research. Begin by ensuring your keywords, title, and abstract are effective, as they are essential for publication success. Without them, most articles would likely not be found by interested readers. This is because keywords are used by journals, search engines, and databases to classify articles. Once the reader has been guided towards your article based on the keywords, the title and abstract act as marketing tools to entice the reader to engage with the full article. Remember the title should highlight the core content of the article. The function of keywords is to supplement the information given in the title. They should serve as additional pointers. Words or phrases from the title should not be used as keywords. If possible, publish through open access. Open-access articles have been shown to have a greater research impact (i.e., they are cited more frequently) than articles that are not freely available (this has been shown empirically; see here). If possible, target the most eminent journals that are relevant to your work, as these journals will have large readerships. Look at the references in your article. Are any journals referenced multiple times? Are they relevant? Input your title or keywords into Google Scholar (or Scopus or Web of Science) to find journals that have published on similar topics. Use PubMed (or institutional webpages) to investigate where leading peers in your field are publishing. Remember to always Think Check Submit before submitting, to avoid publishing in predatory journals. This is a permanent digital ID linked to all your personal information. It will keep you connected to your body of work, even if you change your name or move institution. Post a link to your article on social media platforms. Add a non-technical summary to entice a wider readership, or even better, a video abstract and/or podcast (see below). This is a great way to open up a conversation with your audience, receive feedback, and possibly find future collaborators. It will also help you perfect your ability to communicate your research to the wider public. If possible, post on your university’s social media platforms. There is an ever-growing number of social networking platforms. However, you don’t need to be on all of them to make an impact. Posting on one or two will suffice. Twitter is possibly the ultimate platform, and one third of all scholars are now active on it. It is an easy way to promote your work. You can also keep up-to-date with advances in your field and other areas of interest, follow the activities of your colleagues and peers, and be informed of upcoming conferences. There are many social networking platforms specific to researchers, including the popular sites ResearchGate and Academia.edu, which have been described as Facebook for academics. However, please remember that these sites are not open access repositories. 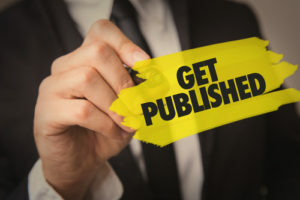 Check your publisher’s copyright policies before uploading/sharing articles, as you may not be permitted to share paywalled articles on these platforms. ScienceOpen and MyScienceWork are data sharing/discovery platforms on which you can promote your work. They also have all the social networking features of ResearchGate and Academia.edu. 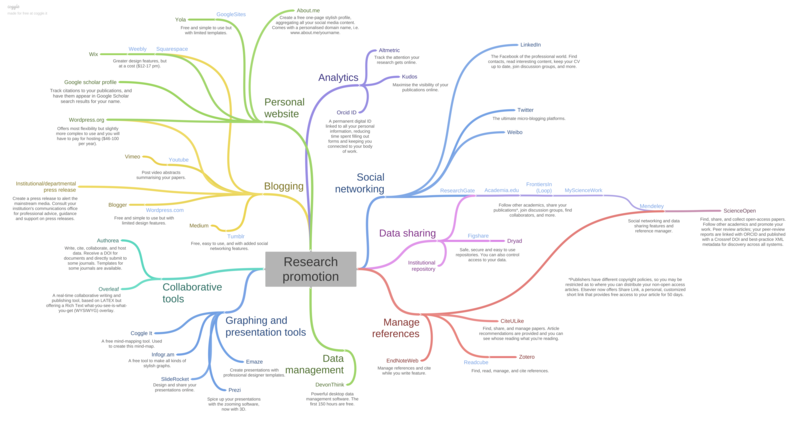 ScienceOpen comes with many additional benefits for researchers. It has excellent data searchability, is superior to Google Scholar and comes with 18 filters, including citation number and ratings. You can also peer review other articles, which will be published with a Crossref DOI. This is important as “alternative” contributions to scholarly research (e.g., teaching performance, peer review contributions) will likely play a more important role in measuring impact in the future. Mendeley, Zotero, and CiteULike are popular online (and desktop) reference managers on which you can promote your work and connect and collaborate with your peers. Videos are proven to be one of the most engaging means for sharing content. A video abstract is a 2–3-minute video (video bytes are shorter, approx. 1 min) that outlines key features of a published article aimed at a broad audience. It acts as an advertisement to entice viewers to read the full article. See examples here. You can create one yourself or, if you have the budget, get it professionally animated and narrated. International Science Editing offers a video abstract/byte service. Animated figures are another effective means to present your data in a novel and accessible way, driving readers to your article. See an example here. International Science Editing offers an animated figure service. A graphical abstract is a concise pictorial summary of a research article, enticing viewers to read your article. See examples here. International Science Editing offers an animated figure service. A short podcast summarising your latest research article can be an effective way to drive engagement and interest in your work. Make your research datasets publicly available (if applicable). Articles with open data are cited more frequently than those whose data are not freely available. Popular data repositories include Figshare, Dryad, and Datahub. Many universities also offer data hosting services, although these tend to be less easy to find. However, Google recently released Dataset Search, which allows readers find datasets wherever they are hosted, whether it is a publisher’s site, a digital library, or an author’s personal web page. Add a link of your most recently published article to your email signature. Consider creating a personal website, detailing your research interests, and include links to your latest articles. Optimise your website for Google, as this is the most common route to any website. Popular free sites include Google Sites and Yola. Consider setting up a blog. This is the most time-intensive but also the most versatile way to promote your research. There are many easy-to-use blogging platforms, including WordPress.org, Medium, and Tumblr. You can use the blog to discuss your research in your own voice, and then engage with readers via the blog’s comment section. You can offer feedback on publications in your field or give your views on emerging trends. You can discuss lectures, life as an academic … etc. There are no limits to blogging. Most universities and institutions have press offices, from which press releases are sent to journalists on behalf of the university to announce news or events associated with the university. If you think your article is suitable for publication in the mainstream media (e.g., newspapers, television) – for instance, findings related to public health or current affairs – contact your university’s press office. Certain publishers and journals also occasionally submit press releases to publicise articles that they believe are relevant and important. This is a more traditional way to promote your work and remains a highly relevant method. Aim to attend at least one international conference per year and, if possible, present a poster or conference article. International Science Editing offers an article editing service and expert poster design service (including editing and formatting). You can then upload your presentation to SlideShare. As an academic, you probably have a multitude of Power Point presentations and lecture slides saved on your desktop. Why not upload these to SlideShare as well? You can even embed these presentations on your own blog or website, thus enhancing the value of your content and giving you a boost in the search engine rankings. Do video abstracts increase the impact of scholarly articles? After promoting your article, it is important to monitor it to see what effects your interventions have had on the discoverability and reach of your research. Many of the platforms discussed so far offer article (and author)-level metrics to measure how an article was received on social media. You can then add your results to your resume. On Twitter, you can see how often your post was liked or retweeted; or how many times your article was read on ResearchGate. Mendeley automatically updates your h-index and citation count on a daily basis. As does Google Scholar Citations. However, please remember Google Scholar does not base citations solely on peer-reviewed literature; they count citations from everywhere on the web (e.g., lecture notes, undergraduate articles … etc.). On ScienceOpen, all your publications come with an Altmetric score, which measures downloads, page views, bookmarks, saves, blog postings, media references, and other social engagement activities. It also gives you a demographic and geographic breakdown of engagement. You can install the Altmetric bookmarklet very easily, which allows you to measure the impact of any article on the web, not just your own (see image below). Track and report your website traffic using Google Analytics. Kudos is a free online platform from which you can manage the promotion of your work. You can add a simple summary of your article, enrich the content (e.g., with videos, datasets etc), share it to other social media platforms, and monitor its impact, all from Kudos. Researchers have found an average increase of 19% in publication downloads when using Kudos.